There I was seven feet deep in the Merced River, staring at a human skull. Was this a watery grave for some murdered miner from the 1800’s or an early native Indian from the Miwok tribe of the Sierra Nevada foothills? As I wondered about the origin of my latest find, I remembered what happened to me the year before on a similar trip with my father, brother, and sister. We were finding gold crowns on the bedrock, and I found one in the sluice box that had a partial tooth in it. My dredging partners and I believed we had a body or skull minus a few teeth close by. It wasn’t until the end of the weekend that my family had a good laugh and admitted they had planted the gold teeth in my hole. 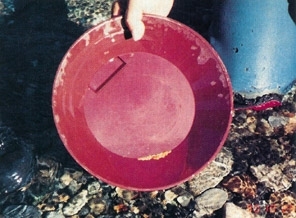 For the complete story read “The Toothless Miner” in the October, 1992 issue of Gold and Treasure Hunter Magazine. On this particular trip, I was dredging with my father, my Uncle John Bard, and his son Michael. My Uncle John was an experienced diver who also had some experience at gold prospecting. It wasn’t until I had started dredging on the Merced River that I found out about John’s prospecting experiences. 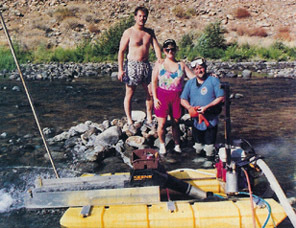 During the 1960’s, John had dredged the American River and had done some prospecting in Alaska. After talking to John about his gold prospecting experiences, I found that we shared a special bond. It was the love of hunting and finding gold, and sharing your experiences with other prospectors. My Uncle John had it, I could see it in his face and hear it in the excitement of his voice. It didn’t take much for me to talk my uncle into joining me on a dredging trip to the Merced River. I pulled into East Bagby on the Merced River on a Wednesday in mid-August. I was working a hole upriver and had uncovered a few crevices with nuggets showing. I cleaned the bedrock and left the gold so that my relatives who were arriving later in the week could enjoy crevicing the gold. They arrived Friday and had a great time picking the gold nuggets out of the bedrock. Unfortunately, the gold played out in that location and we decided to move downriver and try a new location. We opened up our new hole and attempted to locate bedrock. We were about seven feet down, which is a little deeper than I like to work with my 4″ dredge. We were working two-man crews. My father and I were in the dredge hole working through about six feet of overburden without hitting bottom. I was getting a little discouraged because of the possible depth of the bedrock and lack of gold in the overburden. I was working the nozzle when my father tapped me on the shoulder and pointed at something in the bottom of the hole. As I took a closer look at the object, I saw a white cap peering through the overburden. I began to fan the sand and gravel away from the object when suddenly, two eye sockets looked out at me. Well, I almost had a heart attack right there on the spot, and I think I went into a slight state of shock. I jumped out of the hole and started screaming about a dead man. My Uncle John and Michael looked at me in a funny way when I explained that I was moving my dredge because there was no gold, and there were dead people in our hole. About a half hour later, the shock began to wear off. I decided that I just had to have some pictures of my new discovery, so I went back down into the hole and uncovered the skull. When I lifted it out, I realized something was wrong– it was very heavy. Once I took a closer look, I found out why; it wasn’t bone, but a fake plaster, skull. My relatives from hell had struck again! I went crazy and popped out of the water screaming obscenities, that would offend most Christian people. They all stood around laughing and enjoying themselves because they had put one over on me again. They had all done a good job setting me up for it. The night before, we had been discussing the history of the Merced River–it was very interesting how they kept talking about all the dead miners who had lost their lives on the river. Needless to say, I was totally embarrassed. To this day, I can’t believe I fell for the old “Hide a skull in the dredge hole” trick. I can hardly wait to see what they have in store for me next year. Maybe I’ll find an arm, a leg, or possibly a full cadaver.